This month we continue our Find Your Park in our backyard series, featuring the Chesapeake and Ohio Canal National Historic Park. The C & O Canal is a pathway that spans 184.5 miles along the north bank of the Potomac River from Washington, D.C. to Cumberland, Maryland. Each year over five million hikers, campers, bicyclists and history enthusiasts visit the C & O Canal NHP to discover its historical, natural and recreational treasures. The idea for a canal along the Potomac River was first realized by none other than George Washington in the mid-1700’s as a young surveyor. He dreamed of connecting the tidewater of the Chesapeake with the Ohio Valley. However, Washington would have to wait until after the Revolutionary War to promote his idea which led to the creation of the Potowmack Canal Company and the building of skirting canals around the major falls on the river. This made the river navigable downstream, and in good conditions, but a more effective way was needed to navigate the Potomac. 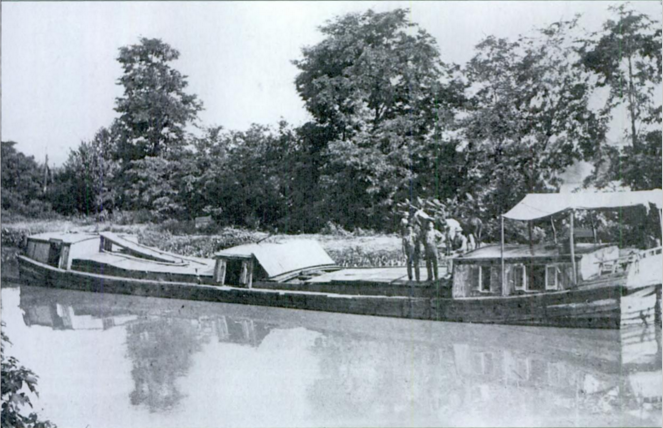 In the 1820’s the Potowmack Canal Company transferred the rights to the new Chesapeake and Ohio Canal Company. Construction on the canal began July 4, 1828 when President John Quincy Adams turned the first spadeful of earth during ceremonies at Little Falls, Maryland. Over the next twenty-two years the construction of the C&O Canal would include 74 lift locks, 165 culverts, 11 aqueducts, 7 dams, and a canal tunnel. Financial difficulties, right-of-way disputes, floods, epidemics, and disputes among the workers delayed the construction of the canal. The canal was finally completed and opened on October 10, 1850 at Cumberland, Maryland. The total costs for the canal was more than 11 million dollars. Captain Raleigh Bender (center) circ. 1905. Hebb Family on the C & O circ. 1918. 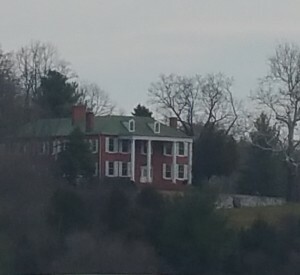 Construction of the C & O Canal reached the Sharpsburg area around 1836 and provided additional employment opportunities for the townspeople and the already flourishing commercial community. Many local families worked a boat on the canal and it required everyone to pitch in together to get the job done. Augustus and Minnie Hebb were one of those families. Augustus, better known as Gus, was the boat captain. Since his family was wasn’t big enough, Gus hired his brother Ira as part of the crew to help. 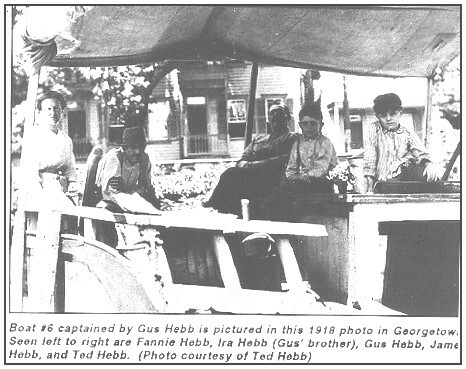 The Hebb children were responsible for tending to the mules and cleaning the boat. They usually went to school only in the winter, when the boats weren’t operating. Years later, after the end of World War II, one of the Hebb children, Theodore (on the far right of the picture below) would purchase a house in Sharpsburg, which would later become the Jacob Rohrbach Inn. Unfortunately, at the same time construction of the canal began, so to did work on America’s first railroad, the Baltimore and Ohio. Competition from the B&O Railroad and destructive floods eventually put the canal out of business. In 1938 the entire canal was sold to the U.S. Government, which placed it under the supervision of the National Park Service. The Park Service did some restoration under the emergency work programs of the 1930s, but projects were halted when the United States entered the Second World War. After the war there was talk of turning the canal into a vehicular parkway to ‘see’ the beauty and recreational opportunities of the Potomac River Valley. However, U.S. Supreme Court Justice William O. Douglas, an avid outdoorsman, opposed this idea. He felt that the long-neglected canal, like the river, was rich in beauty, history, wildlife, and recreational opportunities and needed to be protected. 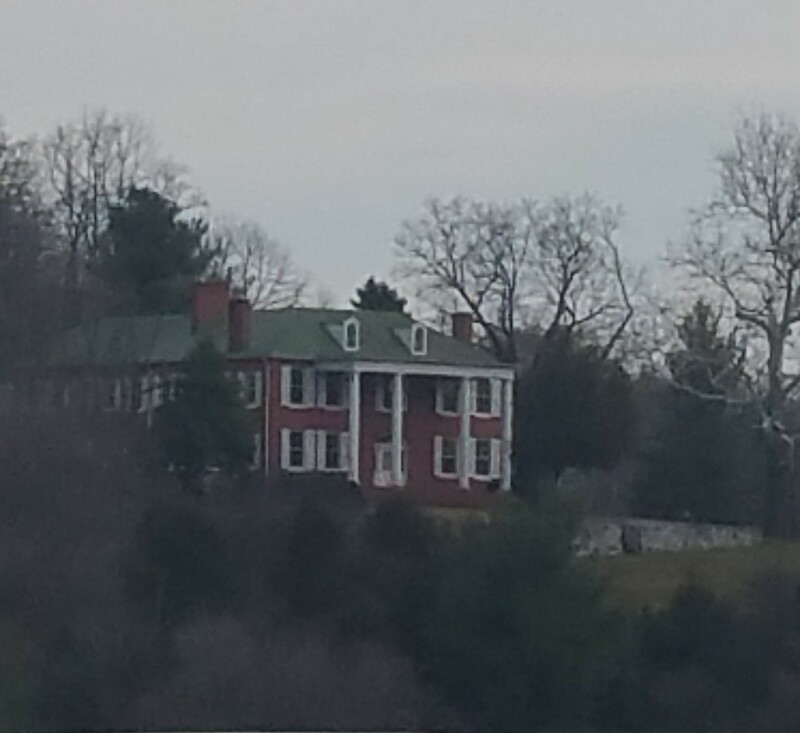 Through his actions, Justice Douglas and other concerned citizens helped save the C&O Canal. In 1961 President Eisenhower proclaimed the canal a national monument and in 1971 Congress established the Chesapeake and Ohio Canal National Historical Park. Our two closest visitor centers at Williamsport and Ferry Hill Plantation are excellent wayside stops to see support structures of the canal’s operation and the small communities that once thrived alongside the canal. Come join the millions of hikers, campers, bicyclists, and others that visit the C&O Canal to experience the rich history, wildlife, and geology of the Potomac Valley. From Georgetown to Cumberland, you can examine how the locks work, take rides in canal boats pulled by mules, and bike and walk along much of the canal’s 185 mile route. Now get out and Find your Park – Visit the C & O Canal.